If you’re obsessed with all things footy like we are, then you’ll be aware that 2018 AFL finals series begins this week. Everyone has finals fever, meaning the kids will be itching to get outside and have a kick of the footy. 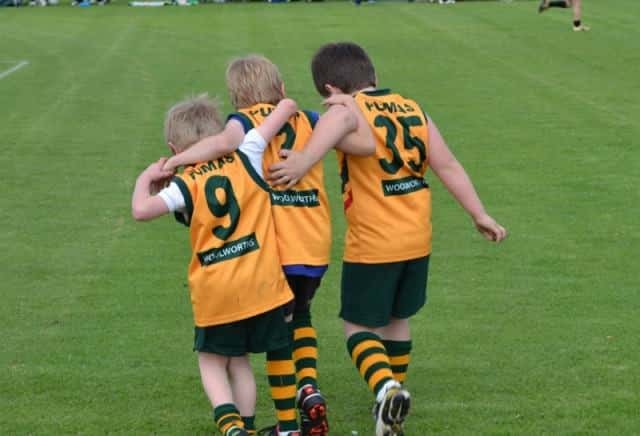 Finding time to take them down to the local oval can be difficult, and as a result they’ll probably end up stuck in the backyard kicking the ball to each other. That’s why we’ve come up with a great way to keep them entertained: turn your backyard into a footy field! All you need is a flat, solid surface, some goal posts and a bit of paint to outline the boundaries. It’s easy and it won’t take you long, and best of all you can do it on the cheap! Constructing the playing surface itself will be the biggest job out of all of them. Firstly, you’ll need to find an area of your backyard that is hard, flat and free of rocks. Try and find somewhere that doesn’t have a potholes, and mow it as flat as possible. You don’t want anyone rolling an ankle or tripping on a rock. Plus, it’s a lot easier to bounce the ball when the grass is flat. Next, you’ll need to mark out the dimensions. Unless you’ve got a humongous property it’s pretty unlikely you’ll be able to fit an actual-sized MCG in your backyard, so you’ll need to make one to fit the size of your backyard. If your backyard is on the smaller end of the scale, you’ve always got the option of making half a field. Simply mark the centre square at the opposite end to the goal posts, and play some half-field footy! Turn Your Backyard into the Ultimate Football Oval. It’s important to mention that mowing the grass could get quite annoying. Natural grass grows quickly, and having to keep it flat regularly will be time-consuming. The best way to keep your DIY footy field in a great condition is by installing artificial grass. You’ll never need to mow again, and your field will stay green all year round! Whichever way you go, make sure the surface is compacted so it is hard. You don’t want any tripping hazards getting in the way! Marking out the boundaries of the field is important. It’ll keep the game honest and fair, as well as reducing the risk of players running into obstacles outside the field of play. You can use everyday white spray paint to outline the oval. Be sure to Include the centre circle, centre square, 50 metre line (to proportion, of course!) and the goal square. What’s a footy oval without goals? There are several ways to create the goalposts, but by far the cheapest and easiest is using existing landmarks in your yard. Trees and shrubs can make great makeshift goals. Ensure they’re trimmed neatly, otherwise the ball might get stuck in the overhead branches! If you’d rather the real thing, you can make your own using thick PVC pipes or wooden posts. Dig a really deep hole to implant them, or pour in some homemade concrete for good measure. It’s probably a good idea to put a bit of padding around the lower portion of the post to prevent any nasty head bumps during a rowdy game. Don’t limit yourself to a stock-standard, all-white footy field. Give your oval a bit of colour; get the kids involved and decorate the posts with family team colours – or with stripes of the family’s official footy team. Once your pitch is ready to go, it’s time to get out there! Arm yourself with a footy, invite the family round and kick off a friendly match.